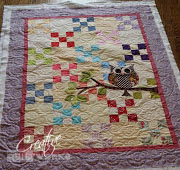 Karen made this adorable baby quilt with a charming owl on it. The back ground is strip pieced 9 patch blocks alternating with white blocks. The colors in the 9 patch blocks form a chain. She got her inspiration here: here. 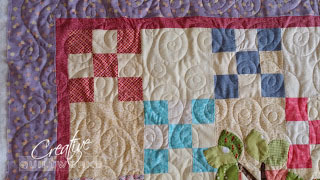 I love the creative quilting on the version on the Quilts of love blog. However, it is quite complicated quilting and Karen is new to machine quilting. So, Karen chose another darling way to quilt it! Unfortunately, my photo did not turn out. 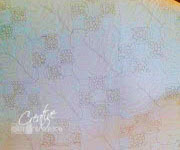 So it is not very easy to see the quilting. The picture is below and you might be able to tell that she did tiny circles in the colored squares. I think she did a loose meander in the white places. I think Karen's quilting was very effective and her quilt is adorable. Below is a close up of her cute little owl. 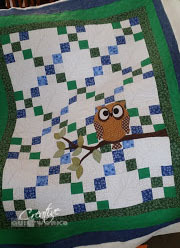 She did such a nice job of applique and that little owl has such a fun personality. Isn't this little owl cute? Julia loved Karen's quilt so she made her own version. She got her inspiration here. The Piper's Girl Blog has a colorful version. You can order a pattern from them using the link above. Here is a close up of how Julia quilted her quilt. 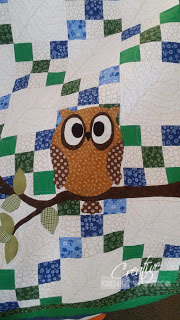 I hope you have fun making your own version of this cute little owl quilt.